2017 has been an eventful year. While there have been challenges around the world we wanted to reflect on some of the positive achievements and contributions we have made or been part of this year! In September 2015, world leaders adopted the Global Goals which frame development for the next 15 years. The Global Goals focus on equity and universality in order to ensure that the furthest behind are reached and that no one is left behind. In order to track progress at the national, regional and global level, a large amount of high quality, timely and disaggregated data is needed. Low Income Countries must be supported to build their statistical capacity in order to increase the availability of good data. While it may be complex and costly, it will not be possible to realise and evidence delivery of the Global Goals without significant improvements in the gathering, analysis and use of disaggregated data. To deliver on these objectives the first UN World Data Forum was hosted by Statistics South Africa from 15 to 18 January 2017, with support from the Statistics Division of the UN Department of Economic and Social Affairs, under the guidance of the United Nations Statistical Commission and the High-level Group for Partnership, Coordination and Capacity-Building for Statistics for the 2030 Agenda for Sustainable Development. 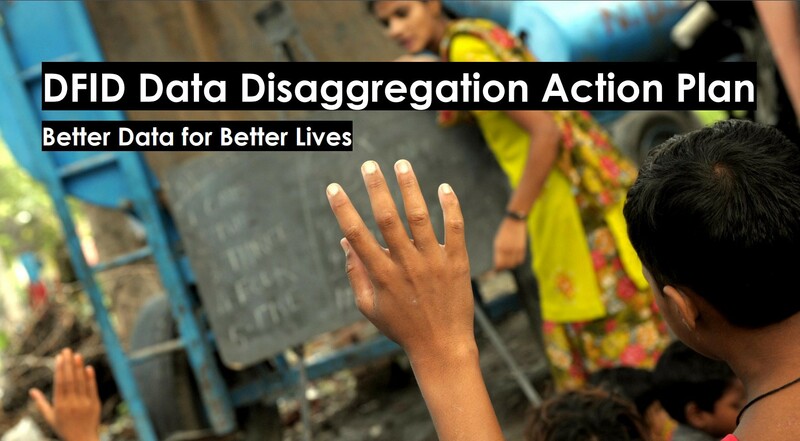 At the World Data Forum the UK National Statistician Launched the DFID Data Disaggregation Action Plan which clearly sets out the steps we will do to play our part in making this a reality! This was a huge moment for us and the start of something critical! In February Lord Bates affirmed our commitment to to delivering the Global Goals for marginalised women survivors of war. The event in Parliament brought together a wide range of stakeholders for critical engagement on how to do things differently together to ensure that the Global Goals deliver for those left furthest behind, particularly for marginalised women survivors of conflict. If properly implemented, the SDGs will help create a safer, more equal and just world which leaves no one behind — including women and girls affected by conflict and crisis. They represent an historic opportunity to change the lives of the most marginalised and the most at risk. It is up to us to ensure they are more than just words on a page. We must continue to push for change in conflict-affected contexts and seize the unique opportunities that exist in them — not only protecting women and girls from the worst forms of violence but by tackling the social norms and structural inequalities that allow the violence and exclusion to continue. In March we were in Geneva for a critical meeting to plan for the implementation of the Road-map for Protection from Gender-Based Violence in Emergencies. The Call to Action is a multi-stakeholder initiative launched in 2013 to fundamentally transform the way gender-based violence is addressed in humanitarian emergencies. The aim is to drive change and foster accountability so that every humanitarian effort, from the earliest stage of a crisis, includes the policies, systems and mechanisms to mitigate gender-based violence risks. Gender Based Violence (GBV) is an issue that must be addressed across all humanitarian response sectors, but this is not operationalized at the global or field level. Leadership and ownership of GBV as a cross-cutting issue is typically weak within organisations and across humanitarian response at all levels. There is not yet widespread understanding of what GBV is or what a humanitarian response to GBV should look like. In April we joined Civil Society Organisations who are working tirelessly to ensure that development is as effective as it can be at a critical meeting in Paris. The Task Team on Civil Society Organization (CSO) Development Effectiveness and Enabling Environment’s work is concerned with advancing the roles of civil society in development. More specifically, the Task Team seeks to promote the international commitments on civil society and development as agreed at the 2011 Busan High Level Forum on aid effectiveness, the 2014 Mexico High Level Meeting and more recently the 2016 Nairobi High Level Meeting, focusing in particular on the CSO enabling environment and CSO development effectiveness. The Task Team engages in a wide range of activities, including policy review, offering recommendations on ways forward and organizing events. In its work, the Task Team engages with the Global Partnership for Effective Development Co-operation as well as the 2030 Agenda and the Sustainable Development Goals. 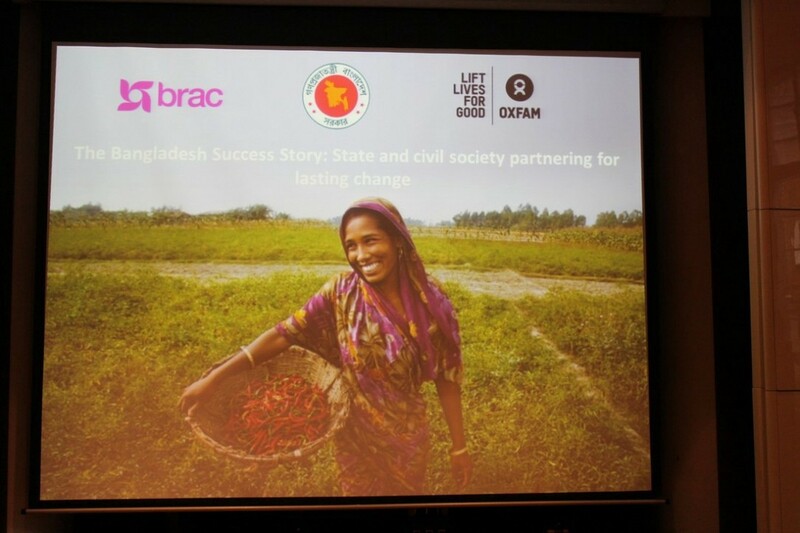 In May we joined with Strategic Partner BRAC at an event hosted by the Bangladesh High Commissioner to the UK Mijarul Quayes at the Royal Overseas League in London highlighting the partnership between the state and civil society for lasting change in Bangladesh. The event, organised in partnership with BRAC and Oxfam International, was attended by parliamentarians, diplomats, civil society representatives and members of the Bangladeshi diaspora. BRAC, an organisation founded in Bangladesh, are pioneers in recognising and tackling the many different realities of poverty. Using microfinance as a platform, BRAC provide integrated services in education, agriculture and food security, health and nutrition, social and economic empowerment, human rights and legal aid. Read more about this event here. In June the Head of DFID Inclusive Societies Gerard Howe and the Head of the DFID Disability Inclusion Team Penny Innes represented the UK at the United Nations Convention on the Rights of Persons with Disabilities Conference of State Parties in New York. The theme this year was the inclusion and full participation of persons with disabilities and their representative organizations in the implementation of the Convention. A new challenge fund designed to strengthen grassroots development organisations working with the poor, vulnerable and most marginalised. The Small Charities Challenge Fund (SCCF) is part of UK Aid Direct, DFID’s main fund for small and medium sized civil society organisations (CSOs). UK Aid Direct operates in the lowest 50 countries in the Human Development Index and in countries DFID considers to be of high or moderate fragility. Grants of up to £50,000 are available for projects of up to 2 years. This was a wonderful and surreal moment as the meeting of the Titchfield group was convened and the case was made for addressing the global problems with data on ageing through the establishment of a UN City Group. As the proportion of the world’s population in the older ages continues to increase, the need for improved information and analysis of population ageing grows too. Without knowledge, policy-makers cannot define, formulate and evaluate goals and programmes or raise public awareness and support for needed policy change. This is critical if we are to realise the ambition of the Global Goals of getting to zero on extreme poverty while delivering on the global pledge made by the international community to Leave No One Behind. Fixing this is not something any one organisation or government can do alone. That is why for the first time, the UK’s Office for National Statistics hosted an important meeting. The meeting is of key global stakeholders, governments, academics, UN agencies, civil society and the private sector. Participants will share knowledge and experience on the core issues of age-disaggregated data and ageing statistics and to work towards the establishment of a United Nations City Group. We are both committed to ensuring our economies work for everyone, not just the privileged few. And that includes eliminating the gender pay gap once and for all. We have spoken today about the importance of closing that gap and championing the rights of women and girls around the world. That means ending the tyranny of domestic violence, sexual violence in armed conflict and educational and economic exclusion. In October we were in Senegal, together with Ministers and other government representatives from across West and Central Africa, international organisations, civil society, women’s groups, youth and community leaders, to galvanise national action to end child marriage. In a region where five out of six of the highest child marriage prevalence rate countries worldwide exist, there is an urgent need to take concrete, holistic and sustainable actions to end the practice in West and Central Africa. While a growing number of countries have taken initial steps to address child marriage, and while recent data shows decline in child marriage, there remains a need to increase momentum and commitment to end child marriage in the region, strengthen south-south sharing between countries, and provide a common understanding on how to translate commitments into tangible action. Britain is leading the global push to eradicate violence against women and girls in all its forms around the world. As part of the 16 Days of Activism to End Gender Based Violence, the Secretary of State set out a new package of UK support to protect women and girls in some of the world’s poorest countries from practices such as Female Genital Mutilation (FGM), child marriage and domestic and sexual violence. This extra UK aid is expected to help around 750,000 women and girls globally over the next three years, by increasing access to crucial services like legal assistance, healthcare, counselling, safe spaces for survivors and working with communities to prevent and break the cycles of violence. It is truly shocking that violence against women and girls remains one of the most systemic, widespread human rights violations worldwide. The high rates of this crime across the world are a global scandal. 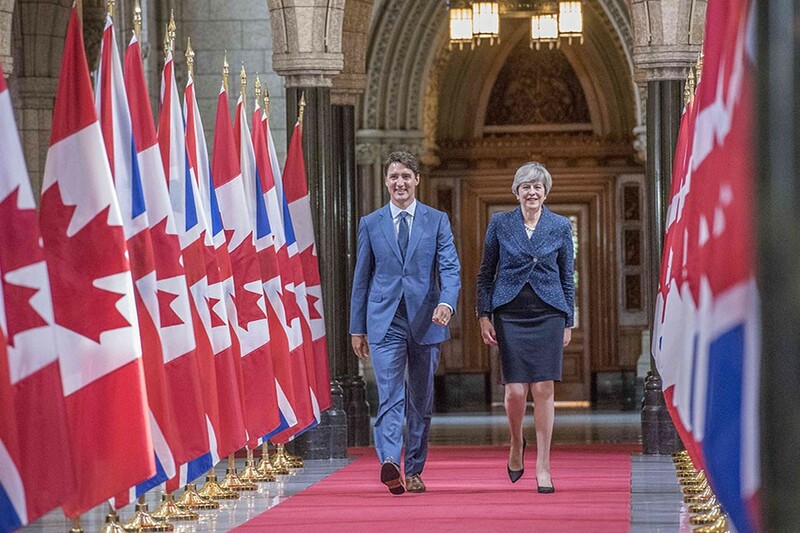 I am proud to say that the UK is leading international efforts across more than 30 countries to eliminate violence against women and girls in all its forms — from ending Female Genital Mutilation and child marriage, to preventing and addressing domestic and sexual violence. Today we are stepping up our leadership — working closely with women leaders and grassroots charities — to help even more survivors in some of the world’s poorest countries overcome the traumas of violence and tackle the root causes of this crime. DFID will provide up to £12 million to the United Nations Trust Fund in Support of Actions to Eliminate Violence against Women (UNTF) over three years. This vital UK aid will support local, national, regional and cross-border efforts to prevent and respond to violence against women and girls, including sexual and gender based violence in conflict areas. For the International Day for Persons with Disabilities, in her first speech as International Development Secretary, Penny Mordaunt announced she will bring together global leaders and technology companies next year to tackle the barriers that prevent people living with disabilities in the world’s poorest countries from reaching their full potential. During a speech at Microsoft’s head office in London, the Secretary of State set out that the UK will co-host the Global Disability Summit in 2018. For too long many people living with disabilities in the world’s poorest countries have not been able to fulfil their potential due to stigma or a lack of practical support. They are, for example, missing out on school and the chance to work. Discrimination is unacceptable in today’s society. I want us all to act now and break down the barriers people with all disabilities face in their everyday lives, so they are not short-changed on opportunities to use their entrepreneurial spirit to help their countries prosper. That’s why I am bringing technology companies, governments and charities together at the UK Government’s first-ever Global Disability Summit in London in July 2018, to show our commitment to transform the lives of people living with disabilities.